Summer time is the prime season for the banks in Canada to compete for new customers. Tangerine, as one of the new banks in Canada, is focused on Online business. This bank has brand new mode of operation, and is thus liked by many young people, especially those who use online banking a lot. 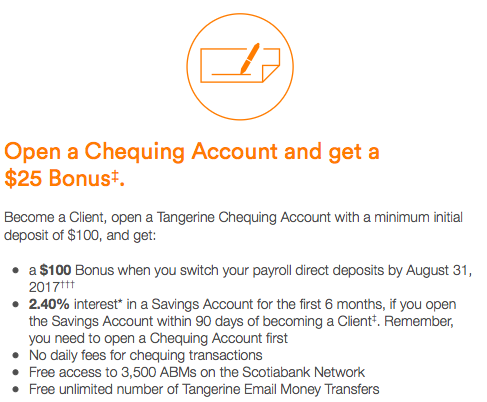 You can now earn 100 CAD bonus if setting up direct deposit with Tangerine（You need to set up before August 31). Of course, you can still earn 50 CAD new account bonus by using a referral Orange Key (Our referral Orange Key 47651893S1). Make sure you use our or other friends' key, or you will ONLY have 25 CAD. An add-on trick: if you use GCR（Great Canadian Rebates）to be redirected to Tangerine website to open your account, another 24 CAD is in your pocket easily. we will both have 2.5 Canadian dollars of bonus.